The global neurosurgical products market is rising at a healthy pace in recent years and the trend is anticipated to continue in the years ahead too. Advancements in medical science and an ultra-modern healthcare infrastructure account for high growth of neurosurgical products market in developed countries. 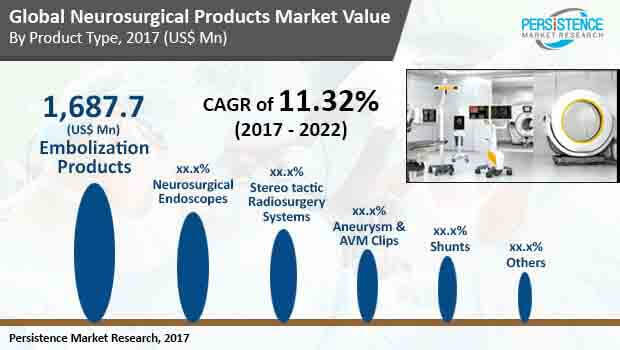 Efforts from medical device manufacturers for technological advances and product innovation have also been instrumental in the growth of neurosurgical products market. At present, the growing geriatric population globally is a key factor behind the growth of the neurosurgical products market. However, developing countries such as China and India are anticipated to account for a larger geriatric population base over developed nations such as the U.S. The elderly are more prone to hemorrhage and stoke as compared to their younger counterparts. As per the American Heart Association, risk of stroke is twice among individuals above the age of 55 years. Considering these factors, the global neurosurgical products market is likely to clock 11.32% CAGR between 2017 and 2022. Increasing funding from governments and public healthcare agencies for development of neurosurgical products in order to reduce the burden of neurological disorders on healthcare systems is also acting in favor of this market. Availability of adequate funds will help researchers develop new treatments for neurological conditions. For example, the National Institute of Neurological Disorders and Stroke in the U.S. increased grants by US$17.2 mn in 2015 as compared to the grants in the previous year. Apart from this, rising incidence of brain tumor is stoking demand for neurosurgical products. Neurosurgical products such as endoscopes and stereotactic radiosurgery systems find extensive application for detecting and removing brain tumors. As per statistics from GLOBOCAN – number of brain tumor cases globally are likely to increase from 256,213 in 2012 to 329,683 by 2025. As per the American Brain Tumor Association, in 2017, nearly 80,000 new cases of brain tumor were diagnosed. Of this, almost 32% of brain and central nervous system tumors are malignant. In 2017, almost 700,000 people in the U.S. were reported with primary brain and central nervous system tumor. Lastly, rising awareness about neurological disorders is also benefitting the neurosurgical products market. In several parts of the world both governmental and non-governmental organizations are carrying out awareness programs for early detection of neurological conditions. For instance, Brain Awareness Week is organized between March 11 and march 17 every year in New Zealand. The drive includes updates and developments from neuroscientists and clinicians in the field of neurology. In the U.S., the National Institute of Neurological Disorders and Stroke organizes Know Stroke campaign each year in the U.S. to spread awareness about symptoms of stroke and the available line of treatments. On the downside, availability of alternative treatments for neurological diseases is challenging the growth of neurosurgical products market. Drug therapies are the first line of treatment rendered for the treatment of neurological conditions. Neurosurgery is opted only if non-surgical therapies are futile. In general, stringent regulations and long hauls are required for approval of medical devices. With technological advances and growth of the healthcare industry, the regulatory standards are regularly updated and need to be adhered to. In particular, approval process for stereotactic neurosurgical products is time consuming, which delays their commercial availability.